Aromatherapy is the alternative branch of medicine. In literal sense, it means "Treatment through Fragrance!" Aromatherapy is the modern name for a very ancient knowledge of healing and improving overall well being using fragrant natural plant extracts. These plant extract are called essential oils, and are known to convey the "Life Force of Plant". Essential oils can be extracted from the herbs, plants, flowers, fruits, bark, roots or the resin of some trees. These magical extracts from plants can amazingly affect our physical, mental, emotional and even spiritual being. Whether its beautifying your skin, reducing weight, prevention and cure of diseases, inducing sexual attraction, relieving tension and anxiety, to sedate you, or to refreshen you, essential oils come in handy. Owing to the fact that olfactory nerves are related to Limbic region of brain, responsible for emotional and sensory responses, the effects are varied and immediate. Aromatherapy is becoming a rage these days. The pleasurable experience has become a part of today`s lifestyle for every person. Scientists and even people in general are experimenting and accepting the amazing benefits of aromatherapy. The best part about it is that, more than one person can bath in the aromatic and effective experience at a time. In Japan, engineers are incorporating aroma systems into new buildings. In one such application, the scent of lavender and rosemary is pumped into the customer area to calm down the waiting customers, while the perfumes from lemon and eucalyptus is used in the bank teller counters to keep the staff alert. 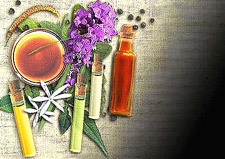 Aromatherapy is the holistic treatment of caring for body. A more precise definition would be that it is the skilled and controlled use of essential oils for emotional and physical health and well-being. Skeptics don`t stand a chance because aroma oils and their recipes are now becoming popular for everyone to test and see for themselves. What`s more interesting is that we have been using the same therapeutic properties of plants through age old traditions in our daily routine, without realising that we are actually imbibing this knowledge unknowingly. Indian kitchens and traditional home recipes for cure are the living example for this phenomenon. This branch extends way back to ancient times and cultures of India and other developed civilizations. On the similar lines, aromatherapy in contemporary scenario is coming up as an extensive global phenomenon.